Emhyr var Emreis is a Character/NPC in The Witcher 3: Wild Hunt. 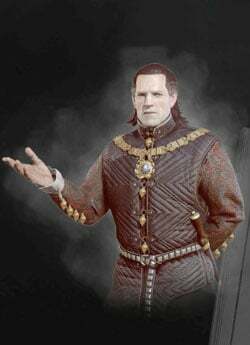 Emhyr var Emreis is the Emperor of Nilfgaard. "Few names in the Continent's history arouse as much terror and respect as that of Emhyr var Emreis, Deithwen Addan yn Carn aep Morvudd - the White Flame Dancing on the Graves of his Foes. Emperor of Nilfgaard, lord of Metinna, Ebbing and Gemmera, sovereign of Nazar and Vicovaro, he was ruler of half the civilized world and aspiring conqueror of the other half. He was a personage whose deeds and decisions shaped the fates of whole kingdoms and populations. What then could he possibly want of a simple witcher? The emperor clearly and succinctly laid out what he wanted. His daughter and Geralt's ward, Cirilla, was in great danger, for the Wild Hunt was on her trail. Geralt, a superb tracker linked to Emhyr's daughter by the iron bonds of Destiny, stood a better chance of finding her than anyone else in the world." Ciri is actually Emhyr's daughter. She came to be Geralt's apprentice via enforcement of the Law of Surprise when she was still very young.